Rotterdam, the most modern city the Netherlands, is divided into a northern and a southern part by the river Nieuwe Maas. Large parts of the Rotterdam are below sea level, mostly behind dikes. That's why Rotterdam has a lot of water management experts. 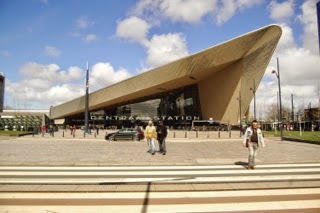 Rotterdam also has a much larger population of people with higher education and higher income within the Netherlands. While some people said that: "Amsterdam to party, Den Haag (The Hague) to live, Rotterdam to work", as a business center, Rotterdam has always been one of the main centers of the shipping industry because it has the most largest port area within the European Countries. Well-known companies with headquarters in Rotterdam are: Unilever, energy company Eneco, pharmaceutical company Pfizer, and consumer goods company Procter & Gamble. The Erasmus University, located on the east side of the city, has a strong emphasis on research and education in social sciences, management and economics. Rotterdam has a reputation in being a platform for architectural development and education through the NAi (Netherlands Architecture Institute), which is open to the public and has a variety of good exhibitions on architecture and urban planning issues. Some of the most famous buildings and structures are: Rotterdam Centraal Station (MVSA Meyer & Van Schooten Architects), Erasmus Bridge-Erasmusbrug (Ben van Berkel), Observation Tower Euromast (Hugh Maaskant), Cube Houses (Piet Blom), Feyenoord Stadion, The Vertical City-De Rotterdam (Rem Koolhaas), also the Delft Gate-Delftse Poort (Abe Bonnema), serves as the headquarters of insurance company Nationale Nederlanden. 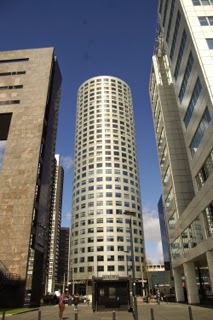 Search for discounted hotels in Rotterdam!